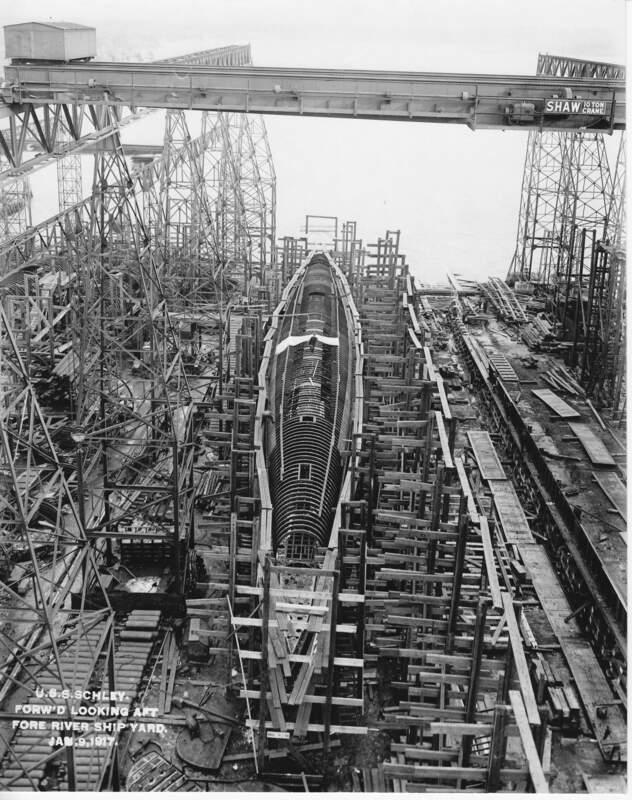 T Class Submarine: Laid down, 21 June 1916, as Schley (Submarine No. 52), at Fore River Shipbuilding Co., Quincy, MA. ; Renamed AA-1, 23 August 1917; Launched, 25 July 1918; Commissioned, USS AA-1, 30 January 1920; Designated (SF-1), 20 July 1920; Renamed USS T-1 (SF-1), 20 September 1920; Decommissioned, 5 December 1922, at Sub Base Hampton Roads, VA.; Struck from the Naval Register, 19 September 1930; Final Disposition, broken up and hulk sold for scrap, 20 November 1930. Specifications: Displacement, Surfaced: 1,107 t., Submerged: 1,482 t.; Length 268' 9"; Beam 22' 10"; Draft 14' 2"; Speed, Surfaced 20 kts, Submerged 10.5 kts; Depth Limit 150'; Complement 4 Officers, 34 Enlisted; Armament, six 21", torpedo tubes, 16 torpedoes, two 3"/23 deck guns; Propulsion, diesel-electric, New London Ship & Engine Co, diesel engine, 4,000 hp, Fuel Capacity, 23,602 gal., Electro Dynamic Co, electric motors, 1,350 hp, Battery Cells, 120, twin propellers. The T Class fleet submarines had several significant problems. Most were related to the advanced concept of a submarine operating directly with the fleet. This required performance levels unheard of at the time. The attempt to reach that performance stretched the technology of immediate post WWI era to its breaking point. Lawrence Spear, EB's normally brilliant designer and John Holland's direct successor was forced to make compromises in his attempt to get the needed performance. Although he can't be held responsible for what was unknown, his design choices ended up dooming the boats in the end. 1.There was a lot of pressure to get these boats off the drawing board and out to the fleet. So to avoid major departures to existing hull construction practices, Spear decided to just expand out an existing hull and frame design, without thickening the hull plating or beefing up the frame members. This resulted in a boat with a 150 foot test depth. When you consider that these boats were 268 feet long, this made for a very constricted operating envelope, in that even a minor departure from the prescribed diving or surfacing angle meant that portions of the hull would quickly exceed test depth. A diving plane jam dive or operator inattention could become critical very fast. 2.Expanding out an existing design resulted in a very complicated tank arrangement. In some cases tanks were inside or on top of another, resulting in obvious complications in piping and venting. The boats were slow divers. 3.The ballast tank arrangement resulted in a lower than expected amount of reserve buoyancy, and when combined with a low and narrow bow they tended to trim down forward, resulting in a very wet deck all the way back to the bridge. 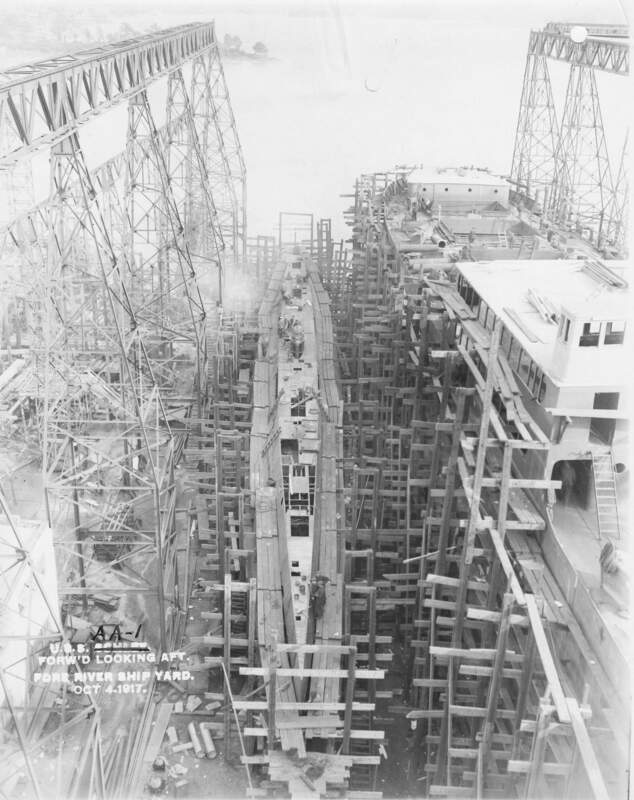 4.Because the torpedo aiming and launching systems of the day were unable to angle the fire of torpedoes, trainable deck tubes were installed in the superstructure. These proved to be difficult to rig out underway and because of the limitations of aiming were very inaccurate. It was also impossible to perform maintenance on the weapons in these tubes, furthering the accuracy problems. 5.Engines part 1. These were diesel-direct drive submarines. True diesel-electric drive boats were over a decade away technologically. No existing diesel plant could provide enough power in a small enough package to fit in the hull. Thus Spear chose to mount two engines to each shaft, with the aft end of the crankshaft on the forward engine connected via a clutch to the forward end of the crankshaft for the aft engines. The initial difficulty came from the inability to precisely match the speed of both engines. There were obviously no computerized control systems in those days and the manual systems were not up to the task. Even a minor speed mismatch resulted in each engine fighting the other and causing torsional vibrations that threatened to tear the engines and mounts apart. 6.Engines part 2. It proved un-workable to run both engines on each shaft with the boat at lower speeds. This resulted in a light load condition for all four engines. Running diesels at or near idle speed for long periods prevents them from developing the necessary heat to fully burn all the fuel. So they smoke excessively and get carbon buildup in the cylinders from the partially burnt fuel, causing ring wear and scored cylinders. So at lower speeds the forward engines were de-clutched and secured so that the aft engines could run at higher speeds. With the aft engines getting a lot more use they wore out faster. When high speed was needed the relatively unused forward engines were started and clutched in causing an unbalanced situation with the heavily used aft engines, greatly aggravating the torsional vibration problems. The T Class was a clear case of ambition outweighing the existing technology. 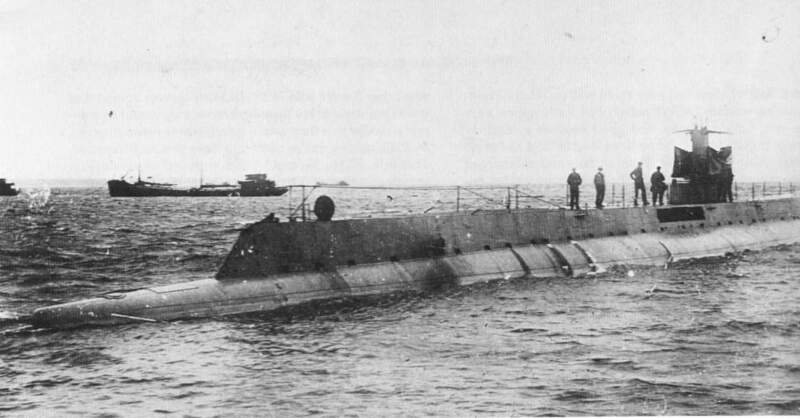 A high speed, long range submarine was a good concept, but it could not be supported by the technology in existence in 1913 when the boats were designed. However, the T Class were valuable in that it showed the designers what didn't work and put Larry Spear and his contemporaries on the path that lead to the successful fleet boat designs of the mid to late 1930's. 533k REAR ADMIRAL WINFIELD SCOTT SCHLEY Image and text provided by Connecticut State Library, Hartford, CT.
Photo from The Salt Lake Herald. (Salt Lake City [Utah) 1870-1909, 28 May 1899, Image 1, via chroniclingamerica.loc.gov. Navy Department to Let Contract for "Greatest Afloat" Vessels Will Have Improvements Based on Lessons of European Conflict. Image and text provided by Library of Congress, Washington, DC. Photo & text by The Washington Times. (Washington [D.C.]) 1902-1939, 06 November 1914, HOME EDITION, Image 1, courtesy of chroniclingamerica.loc.gov. 1.03k World's Greatest Submarine to Belong to Uncle Sam. Image and text provided by University of South Carolina; Columbia, SC. Photo from The Anderson Daily Intelligencer. (Anderson, S.C.) 1914-1917, 27 March 1915, Image 1, via chroniclingamerica.loc.gov. 770k Submarine Monsters for American Navy. It Is fitting that the United States, where the submarine torpedoboat was designed and first built, should have the latest thing in these underseas monsters. So the naval architects in Washington have designed a fighting ship that will prove the most formidable that ever patrolled the seas, as it will be the largest. Image and text provided by Penn State University Libraries; University Park, PA.
Photo & text by Evening Public Ledger. (Philadelphia [Pa.] 1914-1942, 28 May 1915, Night Extra, Image 7, courtesy of chroniclingamerica.loc.gov. U.S. Naval Men Look Forward to Development of a Vessel Capable of 25 Knots an Hour Image and text provided by The New York Public Library, Astor, Lenox and Tilden Foundation. Photo & text by The Sun. (New York, [N.Y.]) 1916-1920, 25 July 1915, FIFTH SECTION SPECIAL FEATURE MAGAZINE, Image 45, courtesy of chroniclingamerica.loc.gov. Two Soon to Be Contracted For Expected to Be the Most Efficient Undersea Fighters Afloat; They Will Be 265 Feet Long, Will Carry Rapid Fire Guns and Have Many Novel Features Image and text provided by The New York Public Library, Astor, Lenox and Tilden Foundation. Photo from The Sun. (New York [N.Y.]) 1833-1916, 17 October 1915, FIFTH SECTION SPECIAL FEATURE MAGAZINE, Image 47, via chroniclingamerica.loc.gov. Vaunted Schley Class Boats a Disappointment Even With Greatest Strides Nation Will Still Be Five Years Behind Europe in Speed and Efficiency Image and text provided by The New York Public Library, Astor, Lenox and Tilden Foundation. Photo from The Sun. (New York [N.Y.]) 1833-1916, 19 March 1916, SIXTH SECTION SPECIAL FEATURE SUPPLEMENT, Image 59, via chroniclingamerica.loc.gov. 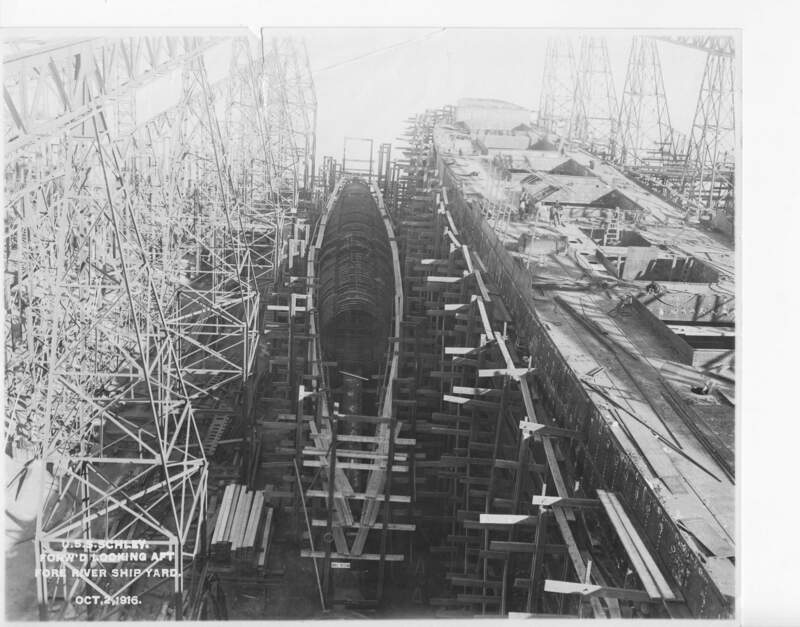 893k Schley (SS-52) bow view on 6 July 1916, two weeks after her keel was laid. US National Archives photo # 19lc 09 from NARA, College Park, Maryland, courtesy of Sean Hert. Editors Note: None of the photos from NARA would have seen the light of day here if it were not for the effort of Sean Hert to scan and send them to me. He and Tracy White have done this innumerable times and I owe them a heart felt debt of perpetual thanks for being my legs from over 6,000 miles away. 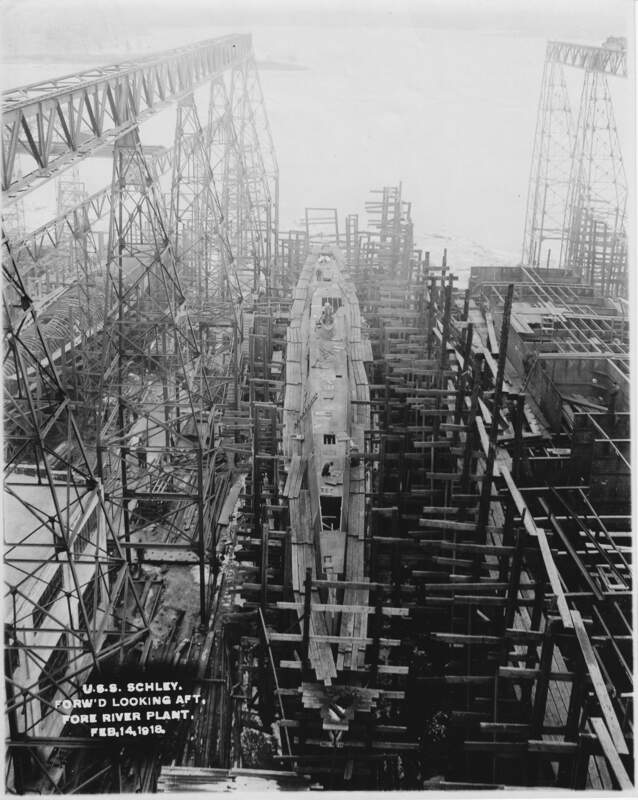 1.91k Schley (SS-52) stern view, 6 July 1916. US National Archives photo # 19lc 08 from NARA, College Park, Maryland, courtesy of Sean Hert. 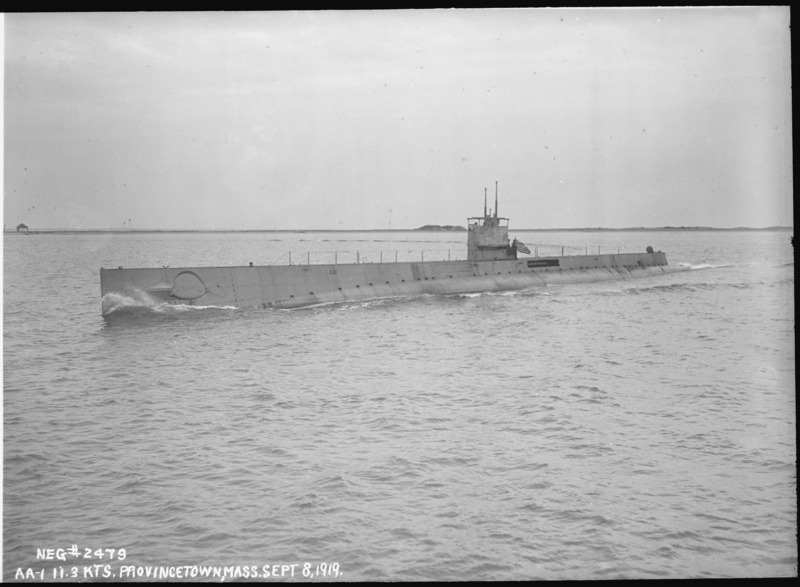 1.10k Schley (SS-52) forward looking aft, 2 Oct. 1916. US National Archives photo # 19lc 10 from NARA, College Park, Maryland, courtesy of Sean Hert. 1.60k Schley (SS-52) forward looking aft, 9 January 1917. 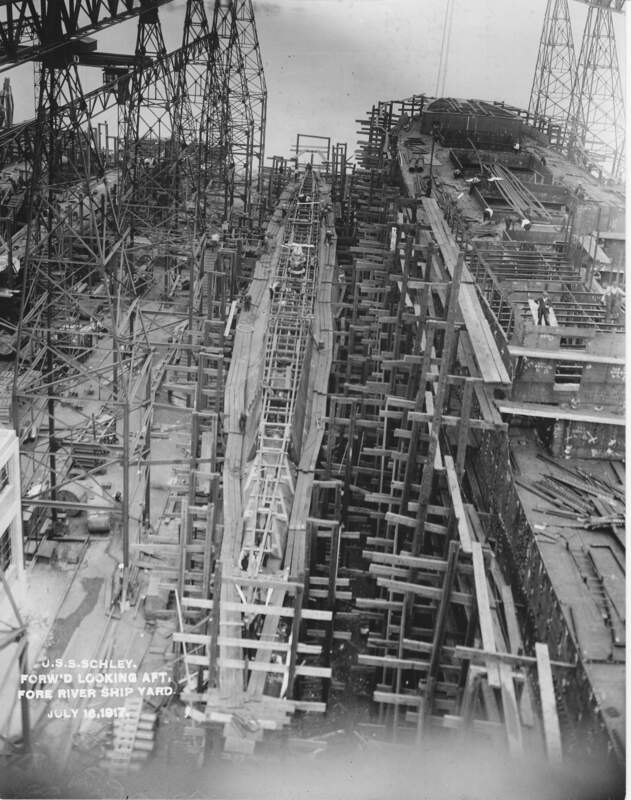 Note the construction of two other submarines on the ways to the left. US National Archives photo # 19lc 11 from NARA, College Park, Maryland, courtesy of Sean Hert. 1.10k Schley (SS-52) forward looking aft, 24 April 1917. US National Archives photo # 19lc 13 from NARA, College Park, Maryland, courtesy of Sean Hert. 1.10k Schley (SS-52) view forward looking aft, 16 July 1917. US National Archives photo # 19lc 07 from NARA, College Park, Maryland, courtesy of Sean Hert. 905k AA-1 (SS-52) view forward looking aft, 4 October 1917. US National Archives photo # 19lc 06 from NARA, College Park, Maryland, courtesy of Sean Hert. 1.00k Schley (SS-52) forward looking aft, 14 February 1918. US National Archives photo # 19lc 12 from NARA, College Park, Maryland, courtesy of Sean Hert. 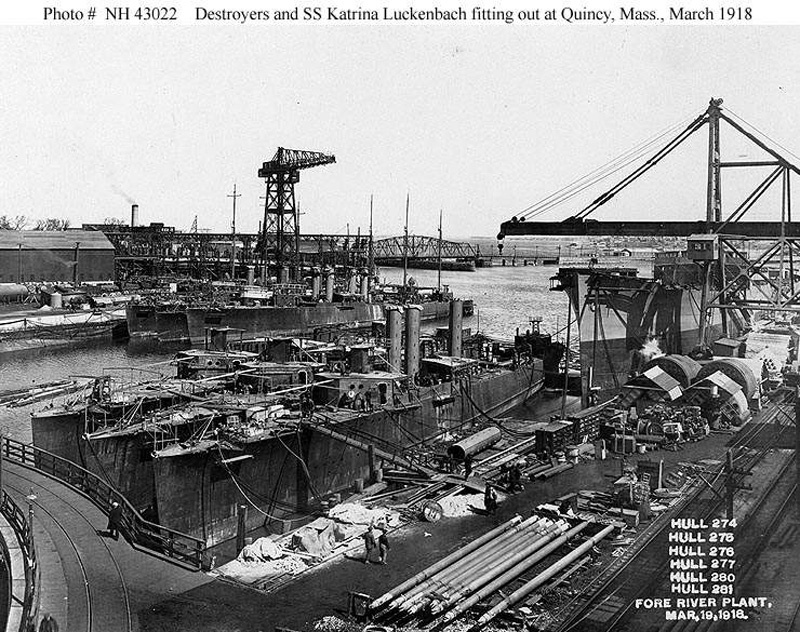 106k Ships fitting out at the Fore River shipyard, 19 March 1918. The six destroyers are Little (DD-79), Kimberly (DD-80), Sigourney (DD-81), Gregory (DD-82), Colhoun (DD-85) and Stevens (DD-86), which had builder's hull numbers 274-277 and 280-281 respectively. The freighter at right is Katrina Luckenbach, yard hull # 267, which served as Katrina Luckenbach in 1918-19. Most of the equipment on the pier is for her. 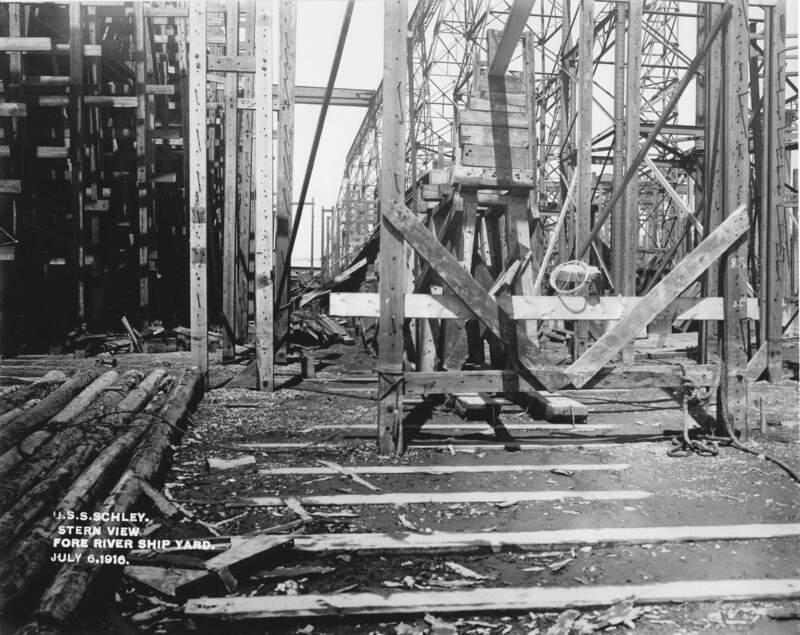 Note the large submarine being built in the background, under the revolving crane. It is probably S-1 (SS-105) or one of the AA-1 class: The AA-1 (SS-52), T-2 (SS-60) or T-3 (SS-61). U.S. Naval Historical Center Photograph # NH 43022. 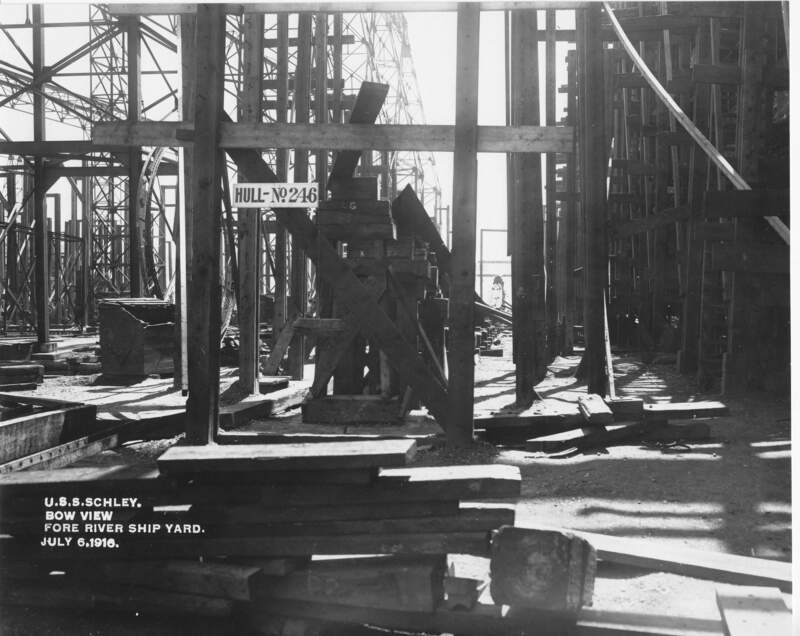 78k Fore River Shipbuilding Company shipyard, Quincy, Massachusetts. 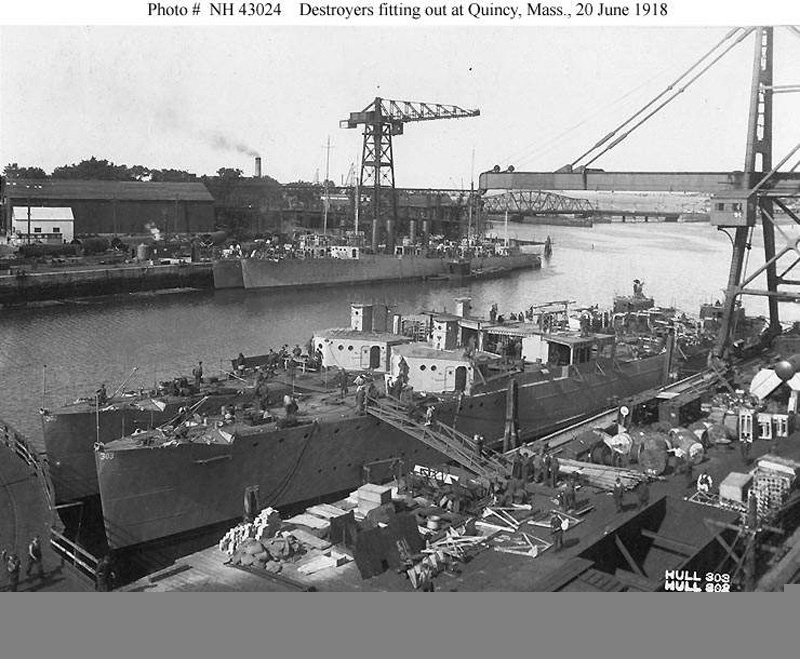 Destroyers fitting out on 20 June 1918. Murray (DD-97) is in the foreground, with Stribling (DD-96) outboard. In the middle distance are Bell (DD-95), with Dyer (DD-84) inboard of her. These four destroyers had builder's hull numbers 303, 302, 301 and 279, respectively, and these numbers are painted in small numerals on the ships' bows. A submarine is on the building ways in the background, under the large crane. It is probably S-1 (SS-105) or one of the AA-1 class: The AA-1 (SS-52), T-2 (SS-60) or T-3 (SS-61). U.S. Naval Historical Center Photograph # NH 43024. 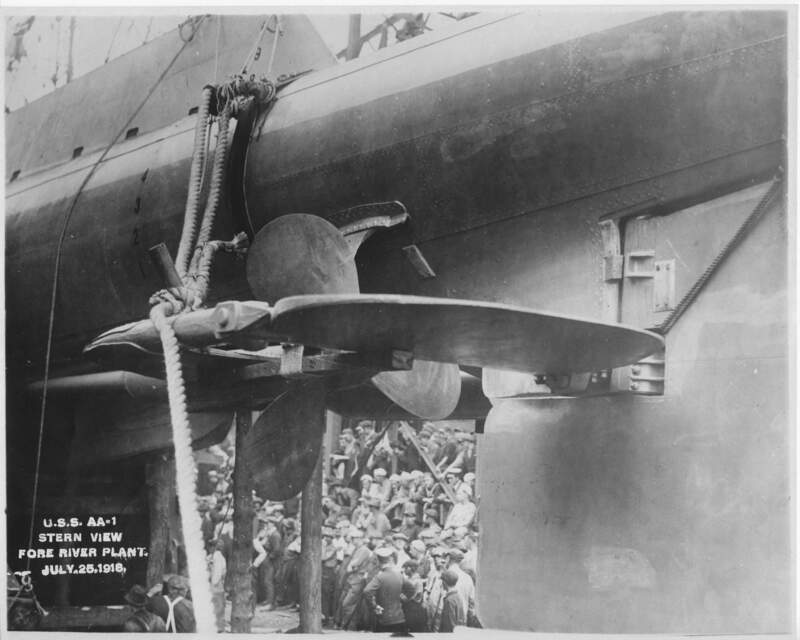 737k The crowd can be seen under her propellers during the launching of the Schley (SS-52) on 25 July 1918. US National Archives photo # 19lc 14 from NARA, College Park, Maryland, courtesy of Sean Hert. 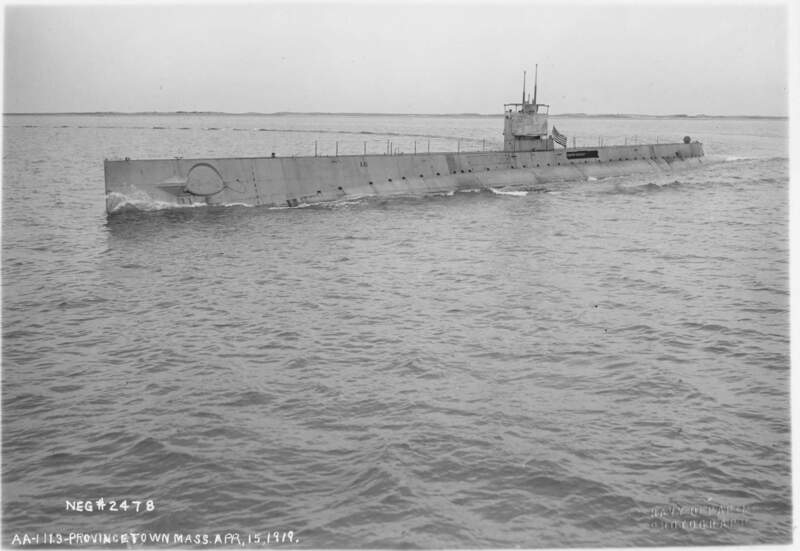 523k AA-1 (SS-52), underway, 15 April 1919, doing 11.3 knots during her trials off Provincetown Mass. US National Archives photo # 19lc2478 from NARA, College Park, Maryland, courtesy of Sean Hert. 737k AA-1 (SS-52), underway, 8 September 1919, prior to commissioning, off Provincetown Mass. US National Archives photo # 19lc 2479 from NARA, College Park, Maryland, courtesy of Sean Hert. 414k Schley (SS-52) at 20.92 knots off Provincetown Mass. 8 September 1919. US National Archives photo # 19lc 2480 from NARA, College Park, Maryland, courtesy of Sean Hert. 34k AA-1 (SS-52) as designed, had single 3-in/23 guns fore & aft on disappearing mounts & pairs of twin trainable torpedo tubes fore & aft of the bridge structure. The 3-in guns apparently were never installed; by 1920 the boat had a 4-in/50. Drawing by Jim Christley, text courtesy of U.S. Submarines Through 1945, An Illustrated Design History by Norman Friedman. Naval Institute Press. 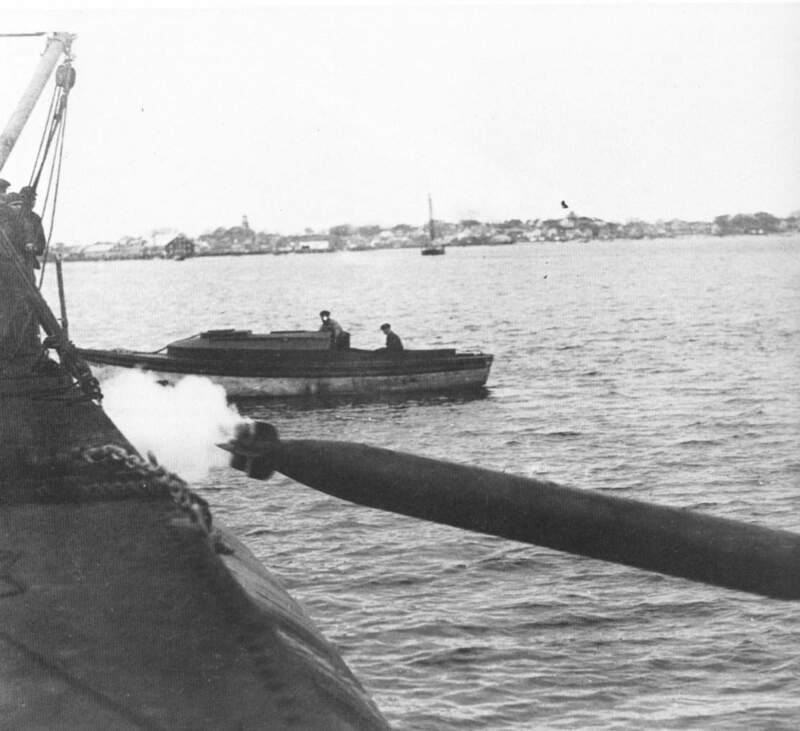 311k Off Provinctown Mass., on 8 September 1919, AA-1 (SS-52), shows the opening for a pair of torpedo tubes abaft her bridge fairwater. At this time, she had not yet been fitted with a 4-in deck gun. Text courtesy of U.S. Submarines Through 1945, An Illustrated Design History by Norman Friedman. Naval Institute Press. US National Archives photo # t1 19lc2481 from NARA, College Park, Maryland, courtesy of Sean Hert. 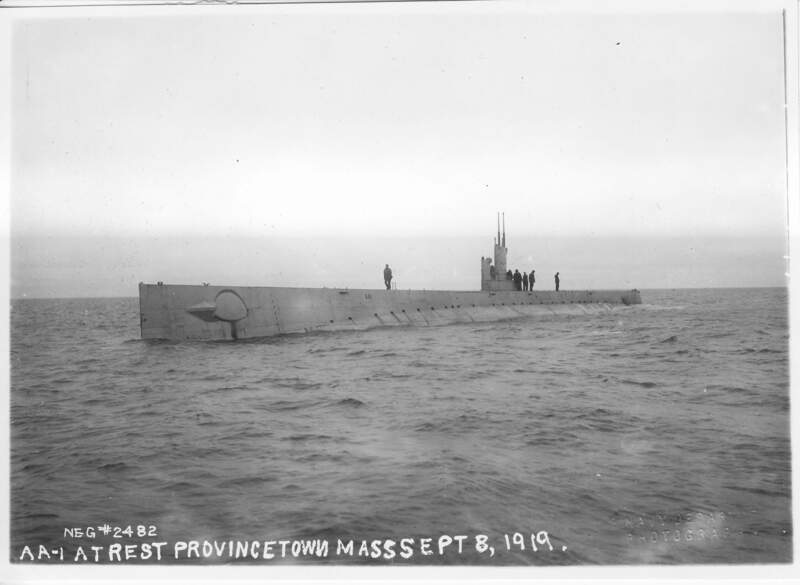 308k AA-1 (SS-52) at rest off Provincetown Mass. 8 September 1919. US National Archives photo # 19lc2482 from NARA, College Park, Maryland, courtesy of Sean Hert. 498k The AA-1 (SS-52), Uncle Sam's New Submarine, the Fastest in the World. Photo by Amerrican Press Association. Image and text provided by Connecticut State Library, Hartford, CT.
Photo from The Ogden Standard. (Ogden City, Utah) 1913-1920, 12 December 1919, LAST EDITION - 4 P.M., Image 12, courtesy of chroniclingamerica.loc.gov. 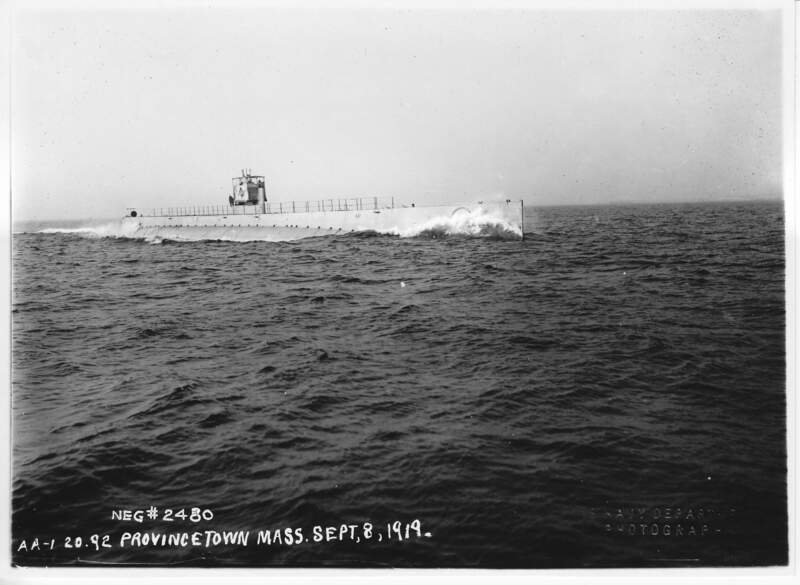 22k The AA-1 (SS-52) makes its way, possibly off Provinctown, Mass. early in her career. USN photo courtesy of Robert Hurst. Text courtesy of DANFS. 27k Circa post 1920 photo of the K-2 (SS-33), T-1(SS-52) & T-3 (SS-61). In the foreground is another unidentified K-boat. The T-1 has a canvas covering over her deck gun. Note differences in the construction of the T-1 & T-3 conning tower fairwaters. Photo & text courtesy of Ric Hedman. 98k AA-1 (SS-52) fires a torpedo from her trainable deck tube. Photo courtesy of Submarine Force Museum & Library, text courtesy of U.S. Submarines Through 1945, An Illustrated Design History by Norman Friedman. Naval Institute Press. 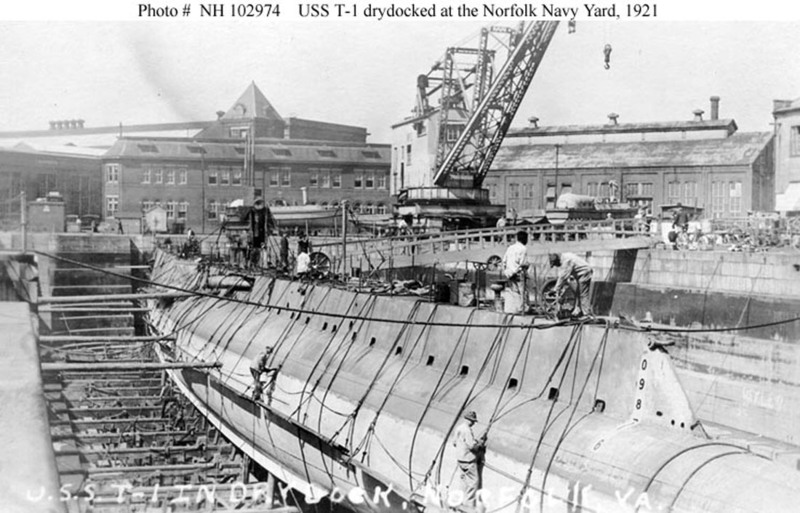 160k AA-1 (SS-52) in dry dock at the Norfolk Navy Yard, Virginia, March 1921. U.S. Naval Historical Center Photograph # NH 102974. Donation of Dr. Mark Kulikowski, 2005. 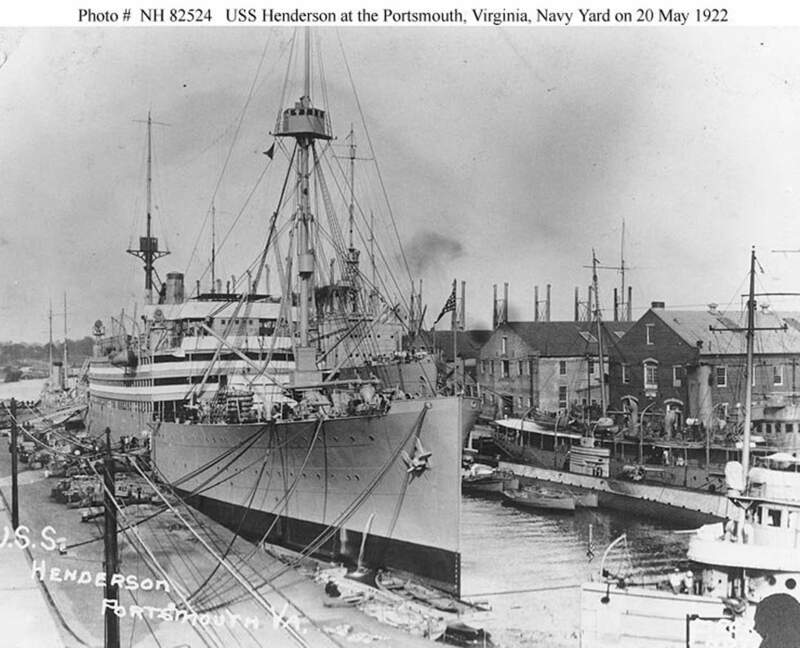 146k Henderson (AP-1) at the Norfolk Navy Yard, Portsmouth, VA., 20 May 1922, just before sailing for Japan with Secretary of the Navy Denby and the U.S. Naval Academy Class of 1881. 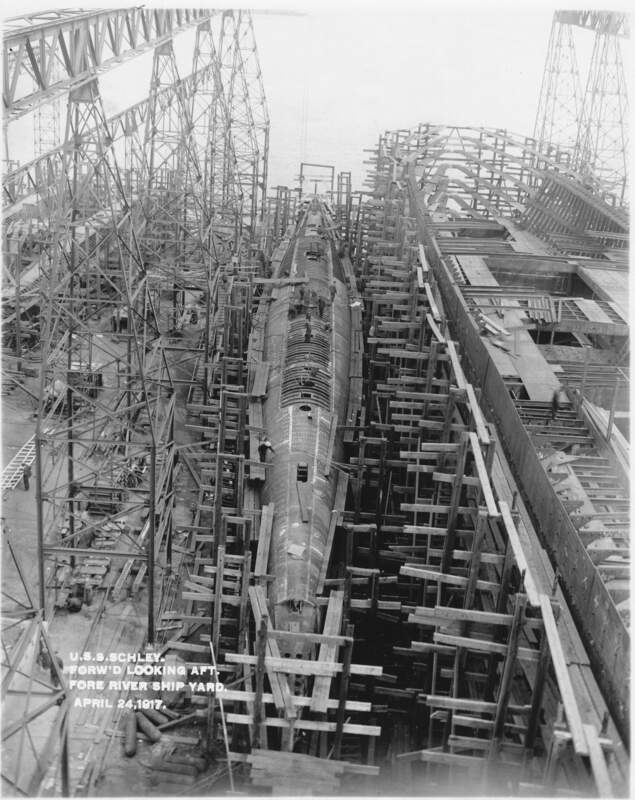 T-1 (SS-52) is to the right, alongside Fulton (AS-1), and the upperworks of two colliers are visible in the background. USN photo # NH 82524 from the collections of the US Naval Historical Center, courtesy of W. E. and R. W. Bennington, 1974, from the collection of William E. Bennington. US Naval Historical Center.